Discover Mainz at your pace! Immerse yourself in the culture, art and history of the city and learn how people lived in the past. The Mainz city walks bring you to all the must-see sights, trace the life and work of well-known local people and give you a good insight into city life. The team of the Tourist Service Center would be delighted to arrange a guided tour that meets your particular interests. Alternatively, choose from the exciting range of discovery tours on offer. The guided tours are organised in cooperation with the local association of tourist guides. For details, visit www.gaestefuehrungen-mainz.de. If you would like to book a city tour, you are welcome to contact us. We offer a variety of guided tours for groups of up to 25 people. 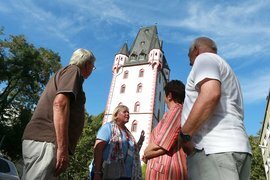 Explore Mainz on one of our special tours that focus on a specific topic. 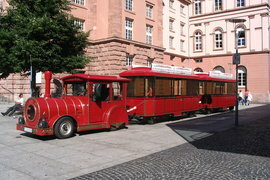 Click here to find out more about sightseeing tours through Mainz. 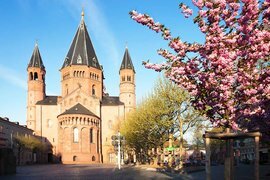 Explore Mainz on a special tour away from the well-trodden paths. 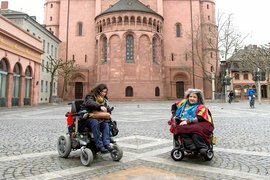 Click here for more information about barrier-free tours through Mainz.